The AKG SR 470 UHF Wireless Receiver is sold as part of the AKG WMS470 wireless microphone series. 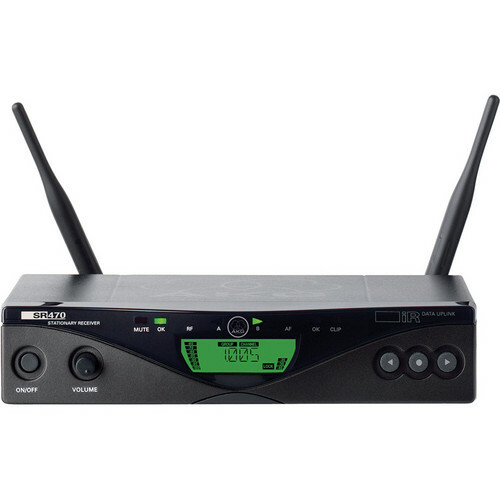 The receiver is available separately and delivers an array of features that include 1200 selectable frequencies across the 30MHz tuning range, balanced XLR and unbalanced 1/4" TS outputs, space diversity tuning, LCD display and more. Infrared sync between the transmitter (sold separately) and receiver allows for remote channel syncing. The Additional features include all-metal construction and up to 16 pre-programmed frequencies per group over the 30.5 MHz tuning range.